Analysis of Protein Phosphorylation: Phosphoamino Acid Determination: D.P. Ringer, Separation of Phosphotyrosine, Phosphoserine, and Phosphothreonine by High-Performance Liquid Chromatography. B. Duclos, S. Marcandier, and A.J. Cozzone, Chemical Properties and Separation of Phosphoamino Acids by Thin-Layer Chromatography and/or Electrophoresis. M.P. Kamps, Determination of Phosphoamino Acid Composition by Acid Hydrolysis of Protein Blotted to Immobilon. L.M. Kozma, A.J. Rossomando, and M.J. Weber, A Comparison of Three Methods for Detecting Tyrosine-Phosphorylated Proteins. Antibodies to Phosphoamino Acids: Immunoprecipitation and Immunoblotting: D. Heffetz, M. Fridkin, and Y. Zick, Generation and Use of Antibodies to Phosphothreonine. J.Y.J. Wang, Generation and Use of Antiphosphotyrosine Antibodies Raisedagainst Bacterially Expressed abl Protein. M.F. White and J.M. Backer, Preparation and Use of Antiphosphotyrosine Antibodies to Study Structure and Function of Insulin Receptor. A.R. Frackelton, Jr., M. Posner, B. Kannan, and F. Mermelstein, Generation of Monoclonal Antibodies against Phosphotyrosine and Their Use for Affinity Purification of Phosphotyrosine-Containing Proteins. J.R. Glenney, Isolation of Tyrosine-Phosphorylated Proteins and Generation of Monoclonal Antibodies. M.P. Kamps, Generation and Use of Antiphosphotyrosine Antibodies for Immunoblotting. Phosphopeptide Mapping and Phosphorylation Site Determination: W.J. Boyle, P. van der Geer, and T. Hunter, Phosphopeptide Mapping and Phosphoamino Acid Analysis by Two-Dimensional Separation on Thin-Layer Cellulose Plates. K. Luo, T.R. Hurley, and B.M. Sefton, Cyanogen Bromide Cleavage and Proteolytic Peptide Mapping of Proteins Immobilized to Membranes. P. Cohen, B.W. Gibson, and C.F.B. Holmes, In Vivo Phosphorylation States of Proteins: Fast Atom7079v, cont.Bombardment Mass Spectrometry and Other Techniques. H.E. Meyer, E. Hoffmann-Posorske, and L.M.G. Heilmeyer, Jr., Determination and Location of Phosphoserine in Proteins and Peptides by Conversion to S-Ethylcysteine. R.E.H. Wettenhall, R.H. Aebersold, L.E. Hood, and S.B.H. Kent, Solid-Phase Sequencing of 32p.-Labeled Phosphopeptides at Picomole and Subpicomole Levels. P.J. Roach and Y. Wang, Identification of Phosphorylation Sites in Peptides Using a Microsequencer. H.E. Meyer, E. Hoffmann-Posorske, A. Donella-Deana, and H. Korte, Sequence Analysis of Phosphotyrosine-Containing Peptides. Phosphopeptide Synthesis: J.W. Perich, Synthesis of O-Phosphoserine- and O-Phosphothreonine-Containing Peptides. J.W. Perich, Synthesis of O-Phosphotyrosine-Containing Peptides. Determination of Phosphorylation Stoichiometry: B.M. Sefton, Measurement of Stoichiometry of ProteinPhosphorylation by Biosynthetic Labeling. J.A. Cooper, Estimation of Phosphorylation Stoichiometry by Separation of Phosphorylated Isoforms. V.D. Vacquier and G.W. Moy, Microchemical Determination of Phosphate in Proteins Isolated from Polyacrylamide Gels. A.J. Czernik, J.-A. Girault, A.C. Nairn, J. Chen, G. Snyder, J. Kebabian, and P. Greengard, Production of Phosphorylation State-Specific Antibodies. Protein Kinase Inhibitors: Peptide Inhibitors: B.E. Kemp, R.B. Pearson, and C.M. House, Pseudosubstrate-Based PeptideInhibitors. D.A. Walsh and D.B. Glass, Inhibitor Protein of Adenosine Cyclic Monophosphate-Dependent Protein Kinase, and Peptides Derived from It, in Study of cAMP-Mediated Cellular Processes. Chemical Inhibitors: Y.A. Hannun, A.H. Merrill, Jr., and R.M. Bell, Use of Sphingosine as Inhibitor of Protein Kinase C. H. Hidaka, M. Watanabe, and R. Kobayashi, Properties and Use of H-Series Compounds as Protein Kinase Inhibitors. T. Tamaoki, Use and Specificity of Staurosporine, UCN-01, and Calphostin C as Protein Kinase Inhibitors. A. Levitzki, A. Gazit, N. Osherov, I. Posner, and C. Gilon, Inhibition of Protein Tyrosine Kinases by Tyrphostins. T. Akiyama and H. Ogawara, Use and Specificity of Genistein as Inhibitor of Protein-Tyrosine Kinases. Y. Uehara and H. Fukazawa, Use and Selectivity of Herbimycin A as Inhibitor of**Protein-Tyrosine Kinases. K. Umezawa and M. Imoto, Use of Erbstatin as Protein-Tyrosine Kinase Inhibitor. Protein Phosphatases: P. Cohen, Classification of Protein Serine/Threonine Phosphatases: Identification and Quantitation in Cell Extracts. P.T.W. Cohen, Cloning of Protein-Serine/Threonine Phosphatases. P.T.W. Cohen and N. Berndt, Reactivation of Protein Phosphatase 1 Expressed at High Levels from Recombinant Baculovirus. M.J. Hubbard and P. Cohen, Targeting Subunits for Protein Phosphatases. N.K. Tonks, C.D. Diltz, and E.H. Fischer, Purification of Protein-Tyrosine Phosphatases from Human Placenta. N.K. Tonks, C.D. Diltz, and E.H. Fischer, Purification and Assay of CD45: An Integral Membrane Protein-Tyrosine Phosphatase. T.S. Ingebritsen, Resolution and Characterization of Multiple Protein-Tyrosine Phosphatase Activities. Protein Phosphatase Inhibitors: D.G. Hardie, T.A.J. Haystead, and A.T.R. Sim, Use of Okadaic Acid to Inhibit Protein Phosphatases in Intact Cells. J.A. Gordon, Use of Vanadate as Protein-Phosphotyrosine Phosphatase Inhibitor. Index. 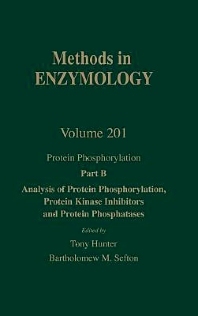 This volume provides a compilation of recent methods for studying protein phosphorylation. Biochemists, cell biologists, molecular biologists, developmental biologists, geneticists, and biophysicists. Tony Hunter received his Ph.D. in 1969 from the University of Cambridge, England. He joined the Salk Institute in 1975 as an assistant professor and has been a professor since 1982. His current interests are the protein-tyrosine kinases of the Src and growth factor receptor families and the protein-tyrosine phosphatases that remove the phosphates added by protein-tyrosine kinases. He was elected as a Fellow of the Royal Society of London in 1987, a Fellow of the American Academy of Arts and Sciences in 1992, and as an Associate Member of the European Molecular Biology Organization in 1992.